Have you wondered how to ship your car in Canada or Internationally? If you are choosing Vehicle Shipping Vancouver inside Canada, you have a few routes to go, but they aren’t all made equal. So here we will explain the differences and give you the good and the bad too. The best practice is to have your vehicle shipped via train. 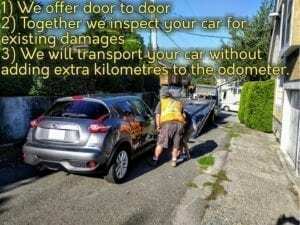 It is inexpensive, does not add kilometres and your vehicle is safe in a train car. You get the “door to door vehicle moving service” for the same price as booking the “depot to depot” when you book with Simple Moves. You are allowed to transport an emergency package, and up to 4 spare tires (+1 the one that already came with your vehicle), but shipping any other item with the vehicle is not allowed. Your vehicle has to have a working e-brake, and please have the fuel tank only half-full. Your vehicle may get dusty from its adventure. From BC to the East Coast it takes about 4 weeks and costs ~$2000. Vehicle Shipping from Vancouver to Toronto is approximately a 3-week wait and ~$1500. From BC to Alberta is approximately 2 weeks, depending on your destination and should cost ~$1000. Let’s start with this: unless you have a vehicle that is very valuable, you will not need this service, because it is very expensive compared to shipping via train. The safest and fastest way to ship cars, with door to door service and dedicated shipping times. If you live in a remote area, this may make sense as it’s a faster solution. This is fun! Stuff as many things in your car as you can! The payment is calculated by the volume and not by the weight of your vehicle. Container Car Shipping happens via Container Ships, thus it takes a long time, wherever you go. Depot to Depot service only. Relatively cheap, however, you will have to deal with a lot of documentation and possible extra charges at your destination country. Email us with your questions. You will not have appropriate insurance coverage. Your car will be accumulating kilometres, burn tires, oil, wipers and your windshield has a high potential to arrive cracked. You are leaving your car to the elements, and to chance even if the driver is really good. You aren’t really saving money on car shipping and here’s the math. Vancouver to Toronto is 4400 kilometres. An average car’s fuel consumption is 10 liters/100 kilometres, thus we are using 440 liters of fuel which equals approximately $500. Let’s add a cracked windshield and a popped tire, because this one is just unlucky. That’s $50 to fix the tire and $50 for a small crack. Change your oil every 5000 kilometres? This is the time to do it: spend another $50. Our cost is $650 on the car and the driver hasn’t been paid yet… Another $600 and your total is $1250. Shipping via train? ~$1500. Is it worth it? I will let you answer that for yourself. The experts at Importing your car to the US is Kevin at Cross-Border Vehicle Services. Please call them for help with importing vehicles to the US.